The sturdy Burbank potting bench makes gardening tasks comfortable, adding a generous work surface any outdoor area. Beautifully designed with architectural touches, the Burbank Potting Bench adds a classic, decorative touch to any yard, with scores of practical uses: The large work surface allows ample space for seed starting or re-potting. Shelves keep things close at hand and store larger objects, while included hooks keep tools easily organized. Stylish and practical the Burbank Potting bench is also perfect for outdoor entertaining. With all of your gardening items tucked away, the Burbank makes a seamless transition into an outdoor sideboard, a handy surface to hold gifts, guest books, snacks and beverages, and anything else you can think of! The Burbank potting bench is a beautiful addition to any space and exceedingly easy to care for- requiring just a simple rinse with a garden hose. Showcasing an island inspired design in a versatile natural teak finish and construction of eco-friendly, plantation grown Shorea wood which is known for its exceptional durability and natural resistance to water, this potting bench is designed for outdoor entertainment use. Features include a thick galvanized steel top, two storage drawers, two lower slatted shelves, stainless steel towel rack and six hooks, and two locking casters. The rust-resistant and work-related galvanized steel top is perfect for a long day in the yard and gets better with age. Enjoy this decorative bench/ottoman from CorLiving. The LAD-616-O bench is upholstered in cream velvet fabric and features a comfortable foam padded seat adorned with a single button tuft in the center, stylish matching top stitching and gently flared legs. This bench can be used as a beautiful seat in your bedroom at the foot of your bed or as a functional piece in your foyer. This great accent piece will last for years and provide a practical solution to extend the seating areas in your home. Enjoy this decorative combination of style and function with the LAD-991-O long bench seat from CorLiving. Featuring a brown linen-look fabric with cushion seating and angled arms. Finished with silver nail head details, this bench creates extra seating where you need it. Use as a beautiful window seat, at the foot of your bed or as a functional piece in your foyer. This great accent piece will last for years and provide a stylish solution for added seating in your home. Bring out your gardening genius. This potting table with storage is packed with features and functionality. Multiple shelves, drawers and cabinet compartments organize garden supplies so they're within quick, easy reach. Spacious work surface for transplanting, seed starting, potting and getting other garden tasks done. Constructed of solid wood harvested from the Cypress tree family with decay resistance similar to Western Red Cedar. Easy-to-follow assembly instructions included. Ships anywhere in North America. Burbank Potting Bench The sturdy Burbank potting bench makes gardening tasks comfortable, adding a generous work surface any outdoor area. Beautifully designed with architectural touches, the Burbank Potting Bench adds a classic, decorative touch to any yard, with scores of practical uses: The large work surface allows ample space for seed starting or re-potting. Shelves keep things close at hand and store larger objects, while included hooks keep tools easily organized. 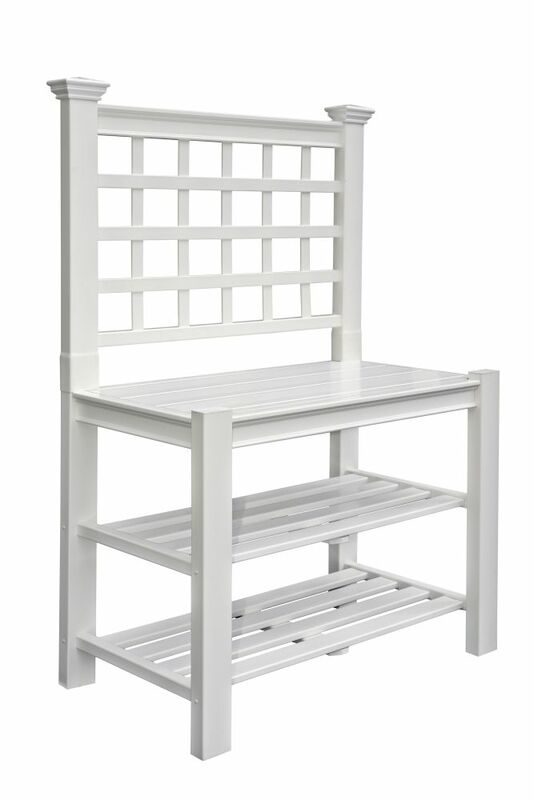 Stylish and practical the Burbank Potting bench is also perfect for outdoor entertaining. With all of your gardening items tucked away, the Burbank makes a seamless transition into an outdoor sideboard, a handy surface to hold gifts, guest books, snacks and beverages, and anything else you can think of! The Burbank potting bench is a beautiful addition to any space and exceedingly easy to care for- requiring just a simple rinse with a garden hose. Burbank Potting Bench is rated 3.2 out of 5 by 6. Rated 3 out of 5 by Cris from Difficult to put together. ... Difficult to put together. Rated 5 out of 5 by Bert from My Husband assembled it quite easily.... My Husband assembled it quite easily. Rated 5 out of 5 by SKIP from Great buy! Although pretty easy to put together, it does take 2 people..one to do and one to hold! Rated 1 out of 5 by Beth from Very misleading The product is described as sturdy and there is nothing sturdy about it. Most of assembly is easy and snap together, but base is not tightly secured, so it sways and wobbles. You can not lean or put anything on it without it moving. Rated 4 out of 5 by FranniM from A workbench with utility This compact but cute work bench is smaller than the one I replaced - but it will not be home to wood bees that plagued my deck for the past few years. Assembly was easy until I got to a point where I needed assistance from my friend to finish up. We were lining up no less than 10 joints at the same time. It took two heads and six arms to get the bench together! So far the bench looks clean and bright and gives my plants a place to hang out or recuperate while I find them a new place in the garden. I am happy with the purchase, just wish it were a little bit bigger.